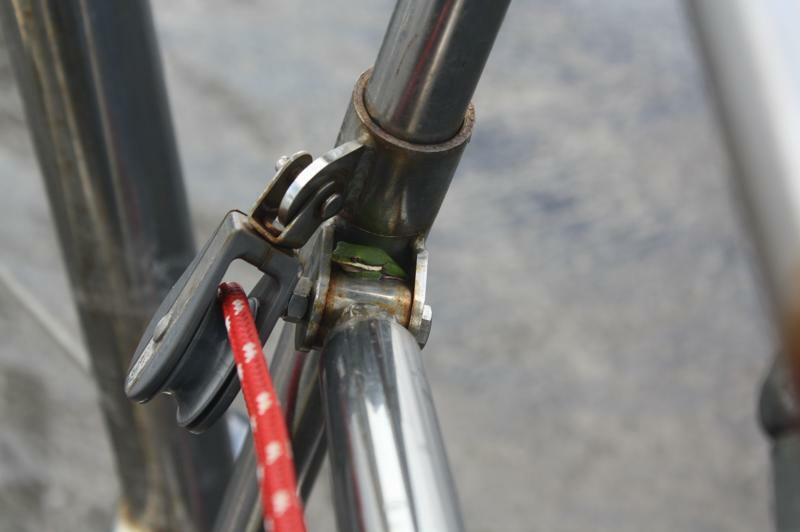 We’ve had all walks of life aboard Rode Trip, and I’m not just referring to single-handers. I’m referring to critters great and small who despite our home’s watery foundation manage to hop aboard and hitch a ride. Some are in need of respite, such as birds with weary wings during a long journey. Some are in need of rescue from the water, not their own natural habitat. Some may simply be exploring. Discoveries of these creatures are usually surprising, sometimes alarming, and almost always accompanied by a loud, “AAAHHHHHHH!!!! EEW EEW! !” followed by a long winded sigh from Brian. Some critters are welcome guests, others are quickly tossed overboard. Brian and I were motoring in the Intracoastal Waterway through the Alligator River – Pungo River Canal. We’d stopped that evening at the end of the canal and dropped the hook about one-quarter mile from shore in the Alligator River. Sometime during the night, our most recent hitchhikers hopped aboard. The next morning, underway once again, we were bashing against choppy waves created by a strong north wind. 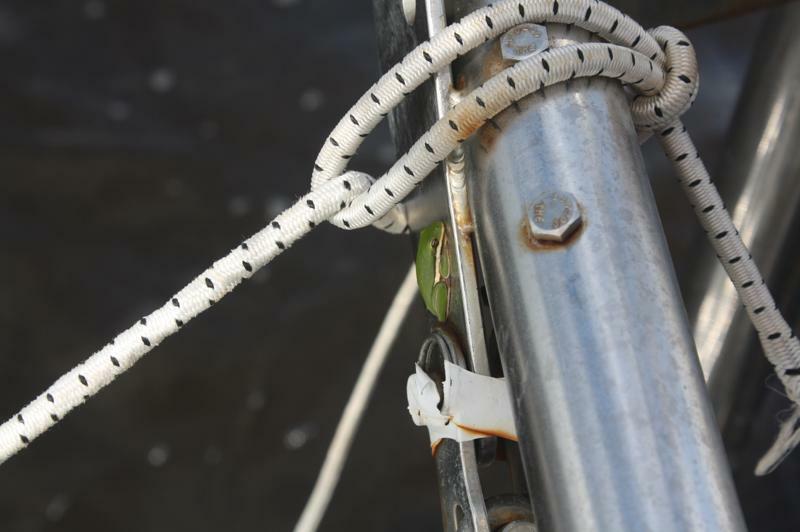 I came into the cockpit presenting breakfast, and as I sat on the port side I noticed something green butted up against the wall of the winch. “Oh, a chrysalis!” I leaned over for a closer look. Hmmm, this was not a chrysalis. Once again I’d confirmed to myself that I should really be wearing my glasses. Upon even closer inspection, this was a frog! 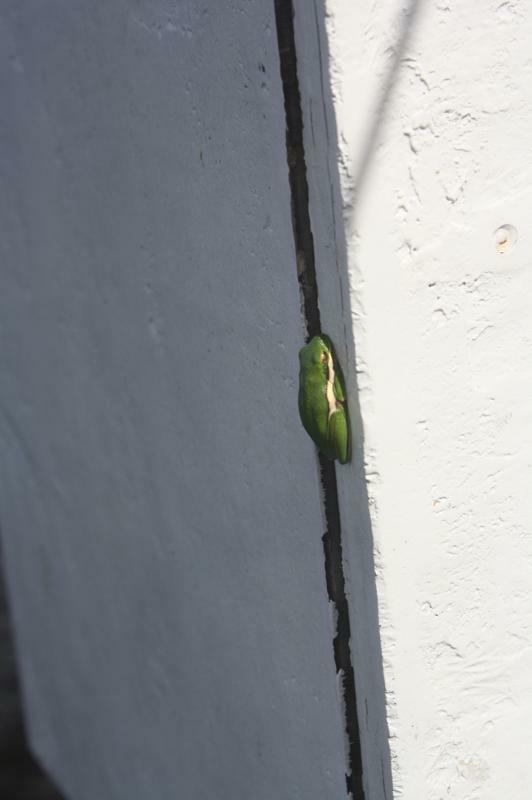 A tiny, very green, soundly sleeping frog! This was a most welcome hitchhiker. 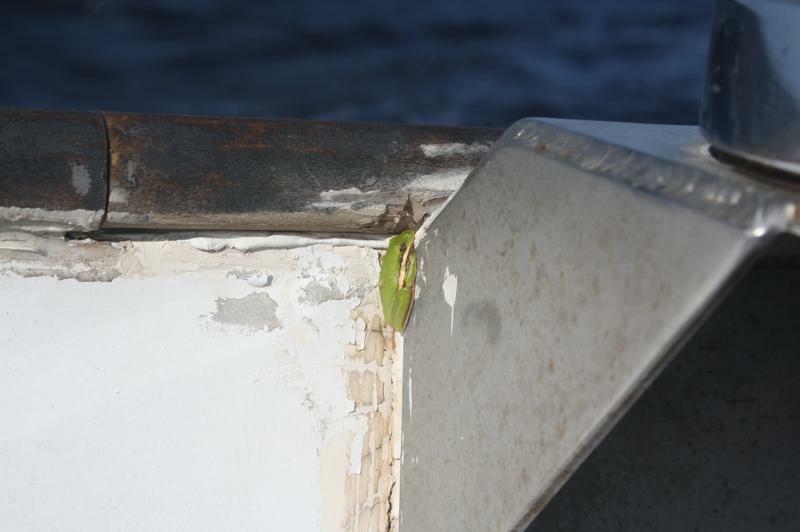 How could I (meaning Brian at my command) toss overboard such a cute little fella? “Let’s call him Toby,” I suggested. “I think it’s a girl,” Brian replied. Since the name Toby happened into my brain without much prompting I had to think for some time about a girl name for the frog. By then, we’d stopped our trip because once we entered the open Abermarle Sound the 25 knots of north wind right on our nose was slowing our progress too much to continue. We ducked behind the protection of Durant Island, just north of the Alligator River Wildlife Preserve. Brian tied the tiller once we’d set the anchor. He moved aside one of the cockpit cushions and out hopped a second frog! “Ah, hah! That one we’ll call Juliet,” I announced. 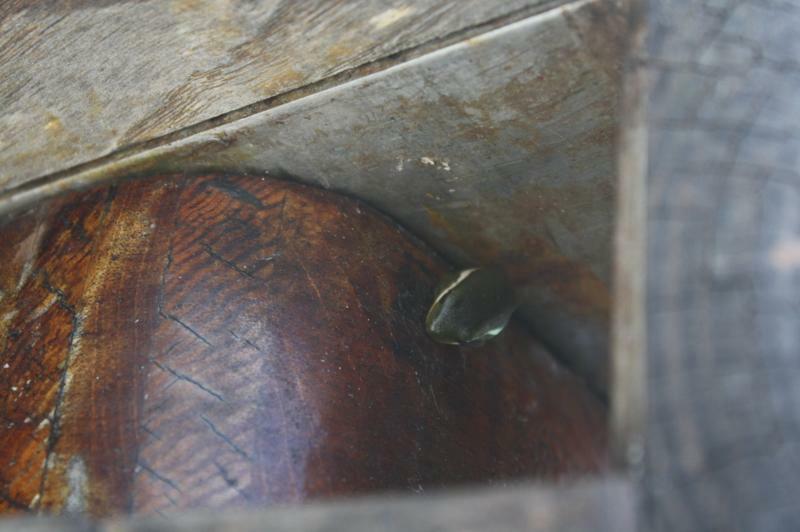 The second frog found itself a cozy nook in the crevice of the boomkin. We identified these as Green Tree Frogs. 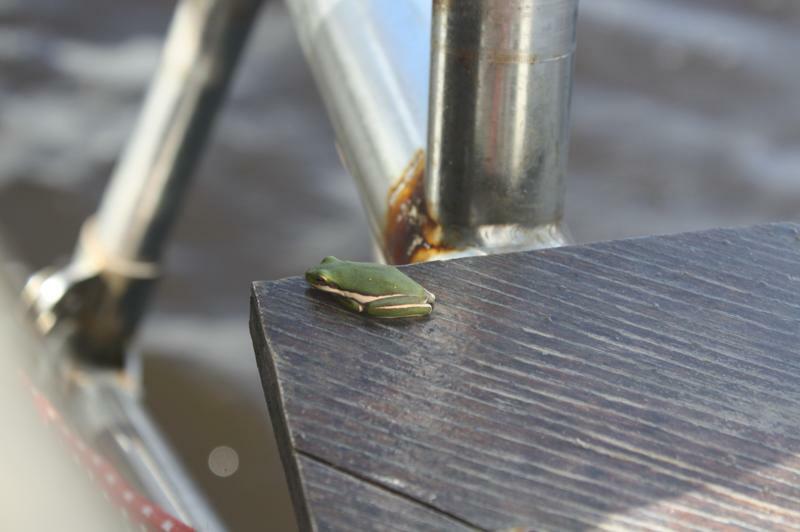 Found in North Carolina along the Coastal Plain, Green Tree Frogs are quite abundant in wetland regions and swamps. They are nocturnal; which explains their sound napping during choppy seas. At night time they can be quite acrobatic while in search of flying insects to eat. Just after sunset, Brian and I went to the cockpit with a flashlight to check on the hitchhikers. Both Toby and Juliet had moved slightly from their previous positions. While searching for Juliet, Brian found a third…fourth…fifth…Green Tree Frogs were hopping about the boomkin as if it were a jungle gym! In total, we’d counted eight frogs! But can they swim? Had they hopped aboard from a floating log? 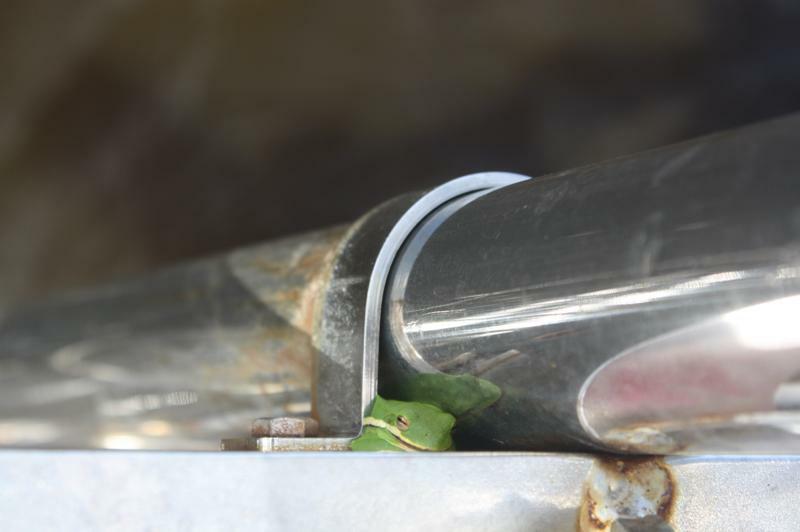 The next morning I went to the cockpit straightaway to check on the frogs. They had all snuggled into nooks and crannies; the boomkin posts, the propane box, on top of the tiller. I managed to find five of the eight. 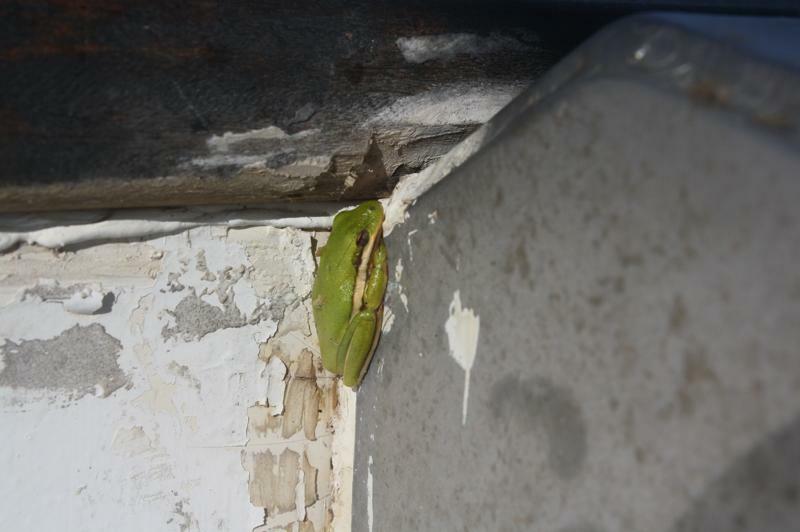 The Green Tree Frogs were soundly sleeping, awaiting arrival at the next scheduled stop, Elizabeth City.